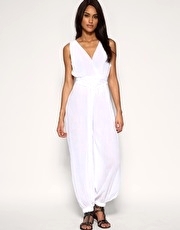 Produktbeskrivning för ASOS Cheesecloth Beach Jumpsuit: This lightweight, loose jumpsuit is totally designed with holidays in mind. Hit the beach in this deep v-front and back style instead of the usual kaftan. We love the nipped in waist and cuffed ankle detail. Just add a bikini and youre good to go.